The holidays are always a fun time of year, but they’re even better when your community gets involved in the festivities! There’s a lot going on at Millenia this holiday season, at nearby Otay Ranch Town Center, and around Chula Vista. Grab some hot cocoa, put on your favorite ugly sweater and reindeer antler headband, and get ready to have a blast this holiday season! In 2018 Millenia residents have plenty of fun and festive options for celebrating the holidays—there’s no need to head off to San Diego to have a great time this year! 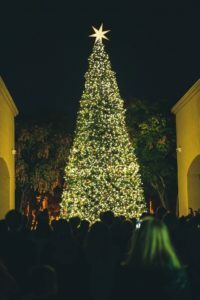 Chula Vista’s Otay Ranch Town Center is hosting a number of events, from evenings at Santa’s Workshop to the fabulous tree lighting ceremony at the holiday farmers market. Just a quick, 10-minute walk from Millenia, Otay Ranch is such a convenient location, it’s almost like celebrating in your own backyard. 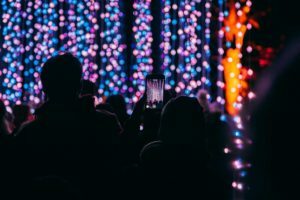 Then there’s the Starlight Parade and the Christmas Circle at Chula Vista, both glorious displays of holiday lights and spirit you won’t want to miss. Millenia is hosting its own celebration this year too. Read on for details about Urban Arctic at Stylus Park! Santa’s taking time out of his busiest season again this year to meet Chula Vista locals at his workshop at the Otay Ranch Library. Santa’s Workshop is open from Saturday, November 17 through Monday, December 24. There’s no charge to meet Santa; photos are an optional purchase. New in 2018 is Grandparents Day on Thursday November 29. 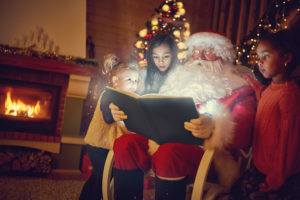 This is a great opportunity for the whole family to get together for photos with Santa! Prefer to avoid waiting in line? Make your reservations online here. Be sure to book a slot for November 29 if you want to see Santa for Grandparents Day photos. Pet Night is back at Santa’s Workshop! It’s a fun family night where your pet can have their photo taken with Santa. Pet Night is all but guaranteed to provide some adorable pictures perfect for social-media sharing and family holiday greeting cards. Please note that pets must be leashed or crated while waiting to see Santa. Pet Nights are always popular, so be sure to reserve your spot here! Start the holiday season off at Otay Ranch Town Center, with a holiday-themed farmers market and tree-lighting ceremony! 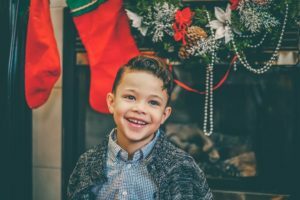 Along with the usual farmers market treats, the event will include free holiday crafts, cookies, and hot chocolate for the kids, plus carol singers and entertainment. After Santa lights the tree, head to his Workshop for the first magical “snowfall” of the season! Don’t forget, the farmers market is also a fun weekly even t. It’s a great opportunity to pick up fresh produce in-season, as well as local specialty foods. Live music provides an entertaining backdrop as you wander the stalls, with a variety of street food vendors to choose from if all that fresh food makes your stomach rumble. To celebrate this festive occasion, dress up in your favorite pajamas, and head over to Santa’s Workshop. Don’t forget to reserve your photo with Santa. This event is sure to create some holiday memories you’ll want to treasure—or at least giggle over from time to time! Memorial Park & 3rd Ave.
A hill with real snow! As the sun goes down, you’ll head to Third Avenue to secure your spot along the parade route. Then enjoy marching bands, dozens of creative floats, and piles of sparkling Christmas lights. Check here to view the parade route and decide where you want to stand to get a great view of the festivities! Head to the Otay Ranch Food Pavilion on December 6 in a creative frame of mind! You’ll be making a unique holiday wreath to hang on the front door of your own home. The workshop costs $15 per person to cover the costs of materials. Be sure to register to save your spot! Urban Arctic is free for everyone, but if you feel like giving, bring along a new, unwrapped toy. We’ll donate it to Chula Vista’s The Salvation Army toy drive, so kids in need in the Chula Vista community can enjoy the holiday season too! Whether you love them or hate them, there’s no denying that ugly sweaters are now a firm holiday tradition. To enjoy Ugly Sweater Night in style at Otay Ranch, show up in your most cringe-inducing sweater, and get ready to celebrate with Santa and a crowd of Chula Vista ugly sweater fans! Make reservations online here to secure your slot for a photo with Santa. Chula Vista’s Christmas Circle is simply magical. Yard after yard full of sparkling lights, along with decorations and music, turn the Whitney-Mankato Street Circle into a glorious holiday display the family will want to return to again and again! To get there, head out onto Olympic Parkway, then merge onto I-805 N. Take Exit 7 for H Street/Bonita Road, follow the signs for H Street, and then turn left onto E H Street. Turn left onto 2nd Avenue, then left again onto Whitney Street—and get ready for a visual feast! Click here for driving directions you can send to your phone. Millenia Is the Perfect Place to Get in the Holiday Spirit! There are plenty of great spots to celebrate the holidays this year—and something for everyone. 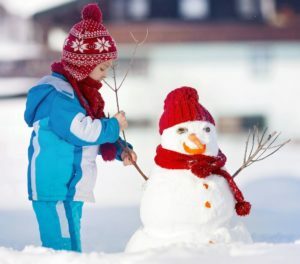 From Santa’s Workshop at Otay Ranch Town Center to the magical Starlight Parade to Millenia’s own Urban Arctic, this holiday season will keep you busy and having fun. Create memories, get to know the people in your local community, and have a happy holiday season, Millenia!